NCERT Solutions are considered an extremely helpful resource for exam preparation. Meritnation.com gives its users access to a profuse supply of NCERT questions and their solutions. CBSE Class 7 english NCERT Solutions are created by experts of the subject, hence, sure to prepare students to score well. The questions provided in NCERT Books are prepared in accordance with CBSE, thus holding higher chances of appearing on CBSE question papers. 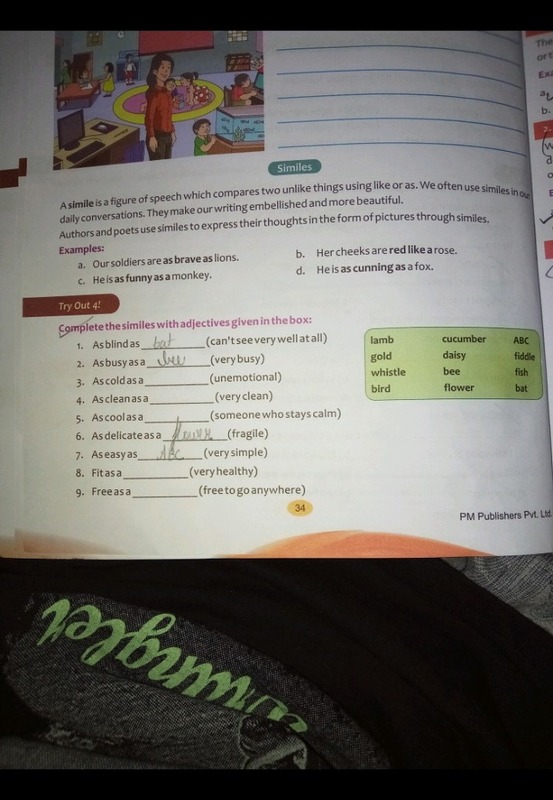 Not only do these NCERT Solutions for Class 7 english strengthen students’ foundation in the subject, but also give them the ability to tackle different types of questions easily. Our CBSE Class 7 english textbook solutions give students an advantage with practical questions. These textbook solutions help students in exams as well as their daily homework routine. The solutions included are easy to understand, and each step in the solution is described to match the students’ understanding. WHAT IS THE FORMAT OF NOTICE WRITING? I. Fill in the blanks with the correct form of verbs given in the brackets. 1. Someone ____________ (knock) at the door. 2. Good boys ____________ (obey) their elders. 3. Water ____________ (boil) at 100°C. 4. Birds ____________ (fly) in the air.
. 6. My father ____________ (leave) for Mumbai tomorrow. 7. The child ____________ (cry) because it cannot find its mother. 8. My mother ____________ (teach) in a college. She ____________ (go) there in the morning. 9. He ____________ (go) to Shimla tomorrow. 10. Thomas Edison ____________ (invent) the electric lamp in 1879. 11. The clouds ____________ (move) across the sky. 12. Sita ____________ (talk) gently with everyone. 13. It seldom ____________ (rain) here in February. 14. The horse ____________ (gallop) across the fields. 15. When I ____________ (go) to see him, he ____________ (sleep). 16. I ____________ (attend) the meeting tomorrow. 17. Cricket ____________ (originate) in England. 18. I ____________ (try) to solve this sum. 19. He ____________ (study) hard these days. 20. I ____________ (write) a new book. I ____________ (hope) to finish it by the end of this month. 21. It was cloudy in the morning, but the sun ____________ (shine) now. 22. Our country ____________ (make) steady progress under the present government. 23. It ____________ (rain) when I left the house.
. Fill in the blanks with the correct form of verbs given in the brackets. 1. Once upon a time, three thieves, who ____________ (steal) a pot of gold in a distant town ____________ (return) to their village. They ____________ (pass) through a small town when it ____________ (grow) dark. Their village ____________ (be) still a long way away. Each of them had a doubt, “____________(be) it safe to travel through the forest with all this gold?” 2. Air and water ____________ (be) necessary for life. Air ____________ (contain) oxygen which we inhale. We ____________ (release) a gas called carbon dioxide, which ____________ (consist) of carbon and oxygen. Trees ____________ (act) as our friends because under sunlight, they ____________ (break) carbon dioxide into two components and ____________ (consume) carbon which ____________ (be) the basis of the food for all the plants. 3. I ____________ (employ) a new servant, Hari. He ____________ (be) quite obedient, hardworking and submissive but sometimes, he ____________ (behave) very strangely. Last evening, I was alone. I ____________ (hear) his cries and ran towards him. He, at once, ____________ (stop) crying. He had not been actually crying, he ____________ (pretend). I ____________ (scold) him for his strange behaviour. Through the columns of your esteemed newspaper, I would like to draw the attention of the concerned authorities towards the nuisance created by the use of loudspeakers. Now-a-days, the use of loudspeakers at religious places, political gatherings, marriages, etc. has become a very common sight. The organizers of these events do not bother to turn off the loudspeakers after the specified time for their use is over. In a lot of cases, the use of loudspeakers continues till late night, creating a lot of nuisance and disturbance for a lot of people. I request the authorities to look into this matter and put stricter rules in place. They must ensure that the use of loudspeakers does not continue after the stipulated time is over. Their efforts in this regard would be much appreciated.